Many people have been expanding their culinary horizons over the last few years - I know I have. But what if you fancy a real change - something truly out of the ordinary? Shkembe chorba - Bulgaria - Depending on which Bulgarians you listen to, shkembe chorba is either a unique national historic tradition, or a vulgar dish that is best forgotten. What is it? Tripe soup made from the stomach lining of cows, mixed with some milk. The soup is seasoned using vinegar, garlic and chilli peppers. As well as its unusual taste, according to legend, drinking the soup after a night out also acts as a hangover cure. Lutefisk - Sweden - This unusual but traditional Swedish dish is made from dried fish (cod, haddock, ling or pollock) prepared using a long process involving caustic soda (yes, the stuff that is used to clean drains). The fish is actually prepared over a period of several days by soaking in water (changing the water daily), then soaking in a caustic solution, and then soaking in water again (again changing the water daily), before finally being cooked. The final period of soaking does make the fish less caustic than it was during the middle period of preparation, but even so, it is essential to immediately remove any residue of the fish from plates, pans, utensils, etc., as otherwise they will be ruined. Lutefisk has a jelly-like consistency, but a surprising mild and mellow flavor - spices are actually added to make the dish more interesting! Lukanka - Bulgaria - This is a spicy sausage made from veal, beef or pork but with a couple of unusual twists. Firstly, it's prepared inside a dried cow's intestine. Secondly, it's hung up to dry for 3 months, pressed and a white fungus is allowed to grow on it. Then you scrape the fungus off, and eat it (the sausage not the fungus). Andouillette - France - Andouillette from France is a unique experience, and not to be confused with the American version, or with the similar-sounding by completely different tasting "Andouille" (a kind of smoked offal sausage). Andouillette is a traditional sausage, originally from Lyon, Troyes or Cambrai. In the past it was always made from parts of the stomach and large intestine (colon) of a pig, but meat from cows/calves is sometimes used nowadays. The unique feature of andouillette is its very intense odor, which admittedly some non-French people consider extremely unpleasant - supposedly it has a very strong smell like faeces. You might say andouillette is an acquired taste. Just in case you do fancy chowing down on some French andouillette, you'll be glad to know that it can be eaten hot or cold. As well as for its aroma, the cold variety is also known for its rubbery texture. Balut - Cambodia, Philippines, Vietnam - A fertilized duck or chicken egg. 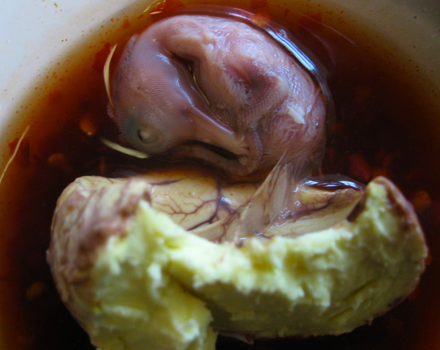 The embryo is allowed to develop for some time, and then boiled inside the shell. Different countries have different preferences for how these eggs are eaten, for example in the Philippines they prefer the chick not to be showing beak, feathers or claws, whereas in Vietnam they like to wait a few more days so that their eggs contain a recognizable baby duck. Ortolan - France - The French have an admirable (?????) tradition of treating pretty much their entire country, and all the lifeforms in it, as a giant larder. Ortolan are tiny birds (about 16 centimeters in length and weighing around 20 to 25 grams). They are a protected species in Europe with numbers in decline, and thus are illegal to sell in France - however it is not illegal to catch and eat them, and this is still widely done in the Gascony region of Southwest France. Ortolan are captured alive, and put in small cages. Their eyes are then poked out, or they may be placed in a permanently lit or dark room to disrupt their feeding habits. This allows the bird to be force-fed with oats and millet - a process that continues until the bird is massively fat - four times its normal size. The bird is then killed by drowning in Armagnac (a distinctive brandy made from the same type of grapes as Cognac), roasted and then eaten. The eating process is to place the entire roasted bird in one's mouth with just the beak protruding, and then slowly chew it for about 15 minutes. You are supposed to experience: first the rich taste of fat and brandy, then the bitterness of the bird's guts, and finally the crunchy bones lacerating your gums and allowing the blood from your gums to add to the flavor. It is traditional to cover your head and face with a napkin when chewing on your ortolan. The napkin is used, depending on who you believe, either to keep the delicate aromas in, or to hide from God. It has been said that the last meal of former French President, Fran�ois Mitterrand, was ortolan. However, I can't say for sure whether he covered his head with a napkin or not. After eating a gourmand meals, why not follow it with a cup of coffee? Of course ordinary coffee could never be satisfactory in such circumstances. How about one of the most expensive coffees in the world thanks to its rich, earthy, caramel-like taste - Kopi Luwak? Kopi Luwak is made from coffee beans (initially in the form of berries) that have been eaten by, and passed through the digestive tract (emerging in the faeces), of a cat-sized mammal, the Asian Palm Civet (Paradoxurus hermaphroditus). If that's not to your taste, you could try weasel coffee (you should be able to guess how the coffee beans are prepared) or perhaps Kopi Muntjak, which is prepared with the assistance of deer.